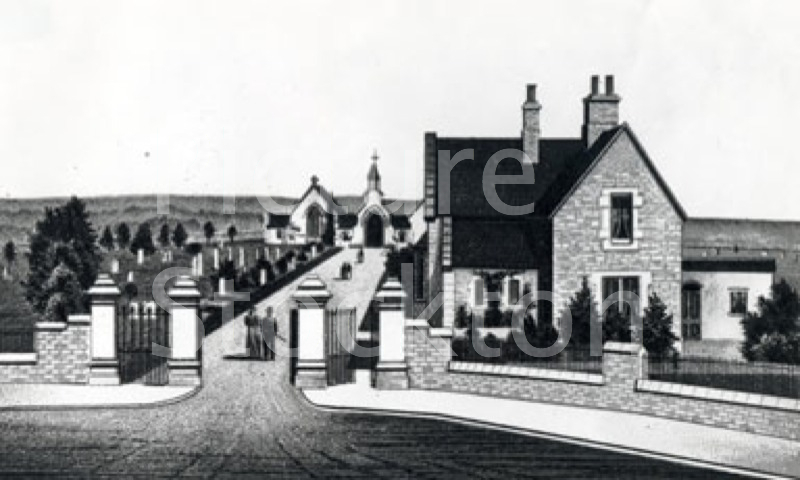 A picture showing Oxbridge Cemetery, Stockton. The main entrance viewed from Oxbridge Lane, the view includes the lodge and mortuary chapels. I’ve been meaning to go there to attempt to find the grave of my 2x great grandmother, I have the grave number but it’s a little difficult when you don’t live near the cemetery. Having lived in the cemetary lodge for the last couple of years I can honestly say that I have not noticed any ghostly presences but trust me I”ll be letting Most Haunted know if I do!! I think this house is one of the best around Stockton-On-Tees and I always will. I worked on the council for a number of years and also did the “decent standard” work on it, so i know first hand the condition it was in. Obviously its up to individuals which story they believe but apparently there has been issues with a foul smell in one of the rooms, now is that because it was derelict and damp or is it an eery ghostly presence? i think this house was always looked after. they never seemed to be anything wrong with it. The cemetery lodge seemed to go into decline 5/6 years ago, and very sadly looked in quite a state (must have been empty), its now lived in, well cared for and looking lovely. It”s so pleasant to see old building being well cared for. The cemetery is well remembered from my childhood as with friends we discovered it to be an abundant source of horse chestnuts (conkers) and acorns in season. Everyone recalls the contests with conkers, and sore knuckles sometimes when a “miss” resulted in a 360-degree forceful swing onto the back of the hand. Acorns were for eating after roasting on a makeshift “stove”. I have maternal and paternal grandparents buried there, Baker and Haslock, interment-taking place circa 1940″s and “50”s. I also recall the pathways providing an effective short cut diagonally across the cemetery. Hats off to the groundskeepers of the day as the cemetery is remembered as being well maintained and orderly, a rather peaceful locale close by a busy thoroughfare. The funeral chapel was considered too scary, and we never ventured inside. The casket-bogey, rather spooky to us, too, was usually stored outside. We never saw it in use but could vaguely imagine its grim purpose. My access and egress to the cemetery was principally via the gates shown in the accompanying picture, it being en route to so many destinations, to school, to visit school-friends, to “hike” to The Regal, The Cinema, The Globe, The Empire, (and was it “The Grand”, a rather dingy picture-house on a side street off the river side of the High Street?) or to market when boiled sweets at a penny a quarter was the going rate. I also bought broken biscuits (of all things, but a treat to me), from a stall (Marsh”s; “the biscuit people” was their slogan) in the busy market on Wednesdays and Saturdays – the way to make a penny go a long way! Back to the Cemetery! None of the monuments were, to my mind, distinguished enough to be recalled clearly today, but their variety in shape and size was impressive enough in mind”s eye. I dimly recall an area not yet fully occupied by burial plots, but no doubt the cemetery has reached full capacity today. Or is it still in use? My mate from school lives here now, David Hardman.